My plan for retirement involved checking out several countries: Spain, New Zealand, Panama, Costa Rica, Chile, Brazil. With that much choice I didn’t expect to fall so hard for my first stop, Uruguay. But it was like going to a party and falling in love with the first girl I danced with. 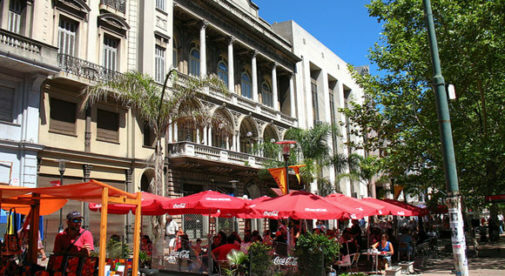 Montevideo, Uruguay’s capital, intrigued me with its historic architecture, plazas, and café culture. Punta del Este, South America’s premier beach resort, awakened my senses, with its beautiful beaches and endless menu of activities. The Rocha region, with its palm tree-dotted prairies and pristine Atlantic beaches, filled me with primal wonder. I first learned about Uruguay from an associate who had clients with a second home there. “Uruguay is just below Brazil, has nice beaches, and is supposed to be safe,” she told me. My interest was piqued. That was six years ago, and I was a real estate agent in Washington State. I’d always wanted to travel, to learn about the world and the opportunities it offers, especially in my former field, real estate. I started researching Uruguay, and the more I learned, the better it seemed. So I made plans for a two-week exploration. I spent time along the coast in Montevideo, Piriápolis, and Punta del Este. I also ventured out on a couple of day trips into the rural region of Rocha and other parts of the Uruguayan countryside. After those two weeks it was clear the real estate opportunities had promise. But more than that, I was awestruck by the people, culture, and the land itself. I extended my stay for another two weeks and, before I left, I made an offer on an apartment in Punta del Este. Uruguay didn’t fade from my mind after I returned to Washington. I simplified my life and started organizing my affairs so that I could live full-time there. It’s been five years since I made my move. And after six years of living in Uruguay, these are the five things I love the most. 1. The people and culture: The warmth of the people of Uruguay made a strong impression on me during my first trip there. Five years later, it still does. You’ll find more basic respect between people here. At the same time, there are fewer social barriers, especially between teenagers and their parents, and young and old. In Uruguay, teachers often hug and kiss their students, doctors can have relaxed conversations with their patients, and coworkers often greet each other with a kiss on the cheek. Most of Uruguay’s population has Spanish and Italian ancestry. There are also people whose families came from other parts of Europe, the Middle East, Russia, and Africa. Although Uruguay’s population is multi-ethnic, it is a relatively homogeneous and inclusive society marked by tolerance. Uruguay also has a growing middle class, with less economic disparity than any other country in Latin America. 2. Effective and affordable health care: After five years, the health care I receive has become one of the things I appreciate most about Uruguay. Uruguay has a variety of health-care options, which include private health insurance, health plans provided by private hospitals, and a public health-care system. I have a private health plan at the British Hospital in Montevideo, where I go for all my medical needs. There, I get high-quality care that currently costs $175 per month. If I ever need hospitalization, my plan covers a private room with a visitor’s bed and visitor’s meals. The rate I pay includes the add-on of a travel insurance policy. One of the things I like most is that I am treated with respect and the doctor takes time to be thorough and explain things to me. 3. A safe and robust real estate market: Uruguay’s real estate market was what first attracted me to the country. You’ll find urban apartments and homes in Montevideo, beach properties, and agricultural land. All categories of real estate here have been appreciating during the five years I’ve lived here. Foreigners can buy, hold, and sell real estate with the same rights and privileges as citizens. You can bring funds for investment into the country without being taxed and repatriate after-tax investment profits. Uruguay has a good property-registration system. Private property rights are enforced by a legal system that is considered one of the fairest and most predictable in the region. Most real estate in Uruguay is owned outright with no mortgage, which provides the market with added stability and protection against economic swings. Right now in Montevideo you can buy a new studio apartment in the desirable Pocitos area for less than $100,000. Some of the best coastal bargains in Uruguay are along its Gold Coast, just east of Montevideo, where you can still find cottages in beach neighborhoods for less than $100,000. In an area called Punta Negra, between the popular coastal areas of Piriápolis and Punta del Este, you can still buy building lots for less than $40,000. 4. Lots of fun things to see and do (for free): Uruguayan communities have lots of things to see and do, no matter what your budget. This is something I didn’t notice at first but have become aware of over time. Like free college education, it is part of the inclusiveness of the culture. It’s common for Uruguayans to meet and socialize in public spaces, and there are lots of places to do this. All Uruguayan towns have plazas, parks, and soccer fields. Punta del Este and Montevideo have ramblas (seaside promenades) where people sit and socialize, walk, run, and ride bikes along the waterfront. All the beaches in the country are public and open to everyone. There are all kinds of free outdoor celebrations that include parades, fireworks, and free street concerts and performances. There are community centers with lots to do in Montevideo and in Maldonado (the town that adjoins Punta del Este). The community center in Maldonado has free music, dance, and performing-arts classes for all residents. 5. Living close to nature: Uruguay has a population of 3.3 million, with almost half the population living in the capital city of Montevideo. Outside the small number of cities and towns, there are vast prairies of grazing land, farmland, forests, and rivers. Spending time in Uruguay’s countryside gives me a sense of relaxation and perspective. There is real quiet and the air is clean. There are lots of opportunities for hiking, camping, fishing, and horseback riding. Uruguay has the perfect climate for a variety of crops and there’s a wide range of locally-grown foods available. The cattle here are grass-fed and given lots of room to graze. They’re not given hormones or antibiotics, either.